Paleolithic, from Taiwanese design studio Shepherd Kit, bills itself as an “entry level worker placement game for kids 7 and up”. I have 4 children ages 5-12 and I thought it would be a perfect intro to games a bit more more complex than Cobra Paw or Kariba. As you might guess from the name, Paleolithic is set in ages past, in a mythical land which approximates cultures from 5000 – 3000 BC. 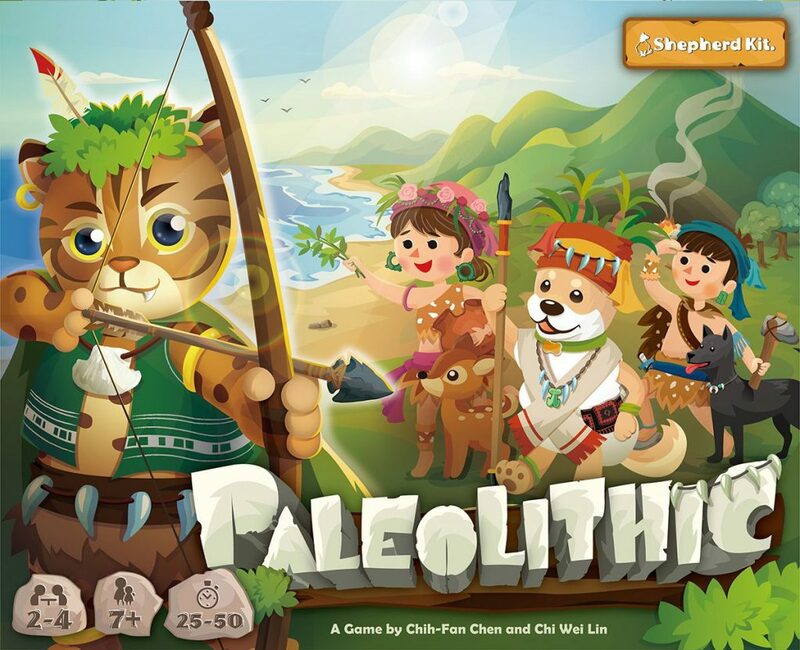 The goal of Paleolithic is to be the player with the most points, earned by gathering resources and spending them to craft cups, bowls, and other types of handmade goods. Points are also awarded by building huts around the board, and from unique culture bonuses found on each player board. Gameplay in Paleolithic is very light, with a bit of a Stone Age vibe to it. Players move their pieces around the board, and roll dice to determine how many of a given resource you might be able to collect. Each space on the board has a different distribution and number of resources (meat, clay, stone, and jade). The first player to construct a combination of 5 huts or crafted goods triggers the game’s end. The player with the most points wins. Paleolithic is utterly delightful to look at, with bright, vibrant, friendly artwork and chunky pieces, easy for small hands to manipulate. This game is heavily dependent on your audience. Adults only might be bored by the light gameplay but remember that it’s targeted for children; and that’s where the game really shines. Kids will be enchanted by the colors and shapes. In a recent game with my sons, they couldn’t stop talking about their animal companion, or the resources they wanted to collect, or the cards they wanted to buy. The game had some translation issues, but with if they tighten that up for the US market I think that Shepherd Kit has a real hit on their hands! After having an opportunity to try out Swiss producer Helvetiq’s game Bandido, I was interested in some of their other small box games. When Andy recommended we give Hippo a try, I was (no pun intended) game. Hippo consists of 12 numbered cards laid out side by side. Each card is illustrated with a section of a swimming pool divided into two or three areas. After the cards are laid out, each player is given a number of tokens that look like little life preservers. On a player’s turn, they roll three dice and then place their life preservers into the different lanes using the dice pips available to them. For instance, if a player were to roll 4-4-2 they could place a life preserver into the 6 lane (4+2) and the 4 lane OR the 8 lane (4+4) and the 2 lane OR the 10 lane (4+4+2). When a life preserver is placed into a lane, it causes any previously placed ones to move up a lane which can cause life preservers to move off of the card. These are returned to their owners. The object of the game is to be the person to place all of your life preservers first. I have no idea what any of this has to do with hippos. 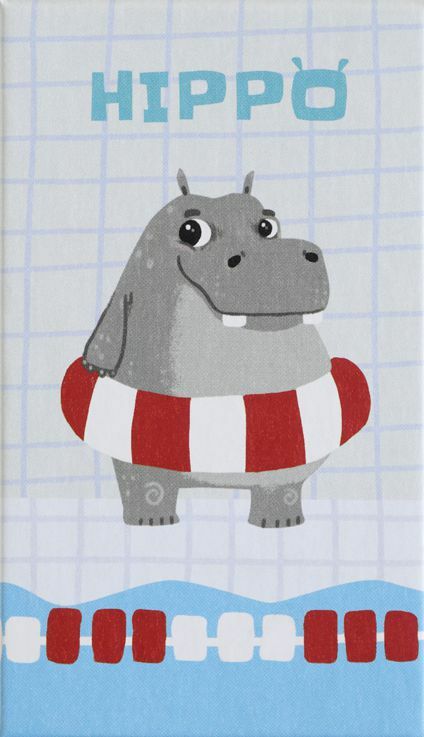 Presumably it’s a swimming pool filled with hippopotami but since they can swim natively, why would they need life preservers? Are we people swimming in the same pool with the hippos? I really have no idea. But I digress. Theme aside, this was actually a pretty challenging (and fun!) game. At first, it doesn’t seem so because the best move is always to offload as many life preservers as possible. However, there is a rule that dictates: if you cause one of your own life preservers to fall out of the pool, then you have to take back all of the life preservers in that lane and you are not allowed to place any of your own life preservers until after you have placed any which you collected that belong to any of your opponents. Obviously, this is something you want to avoid at all costs. The game quickly becomes a game of large gains followed by rapid losses as the players gang up on the person with the least life preservers left. While this sounds unpleasant, it rarely is since every player will experience this treatment at some point in the game. And it also helps that the game plays fairly rapidly. My only beef would be that there isn’t any kind of unlucky dice roll mitigation at all. All in all, though, I really enjoyed Hippo and wouldn’t mind playing it again sometime. Knizia effect /ˈk-nē-tsē-a i-ˈfekt/: a board game that plays quickly and has painfully simple rules, yet has a hidden level of strategy that isn’t apparent until late in the game. As such, you feel compelled to play the game a second time to better apply this strategy. EG Lost Cities is cursed with the Knizia effect. Blue Lagoon does nothing but embrace the Knizia effect (and that’s not surprising since it was designed by the Doctor himself). This game is played over two similar phases with players scoring points after each. In both phases, you place a piece onto the game board on either an island or in the water, following a few placement rules. In this way, you collect statuettes and resources which score set bonuses at the end of the phase. You will also be building up a connection of your pieces. After scoring in phase one, all of your pieces will be removed from the board, except for your huts (not on stone circles). This is important because in the second phase, you can only place pieces adjacent to one of your huts. Planning for phase two in Blue Lagoon is essential. You want to score many points in the first phase, but you must balance that with clever hut placement to set yourself up for the second. 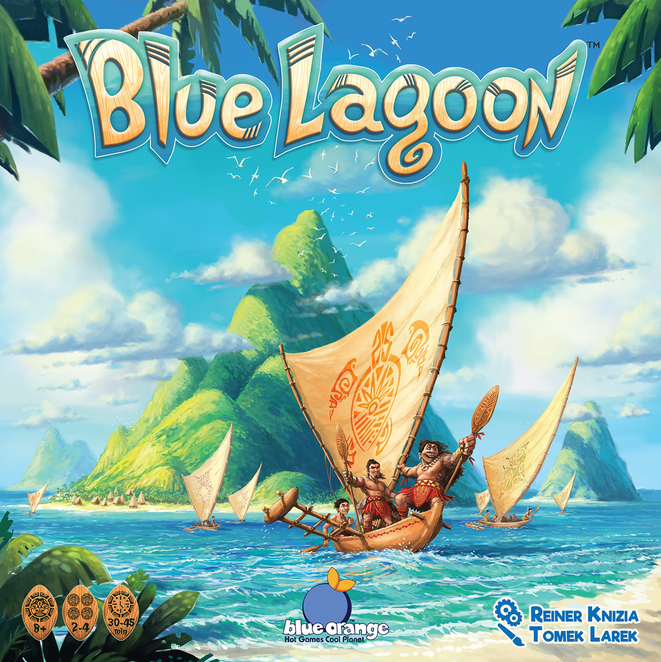 Blue Lagoon is comparable to Through the Desert (an older Knizia title): the mechanisms are similar, there is a lot of player interaction, and they both require you to be pretty mean and cutthroat with your actions. The main difference for me is that Blue Lagoon plays much quicker and, as someone who doesn’t like much confrontation in board games, that suits me just fine. Let’s face it, roll-and-write games are the hottest thing since sliced bread. It seems like 2018 has been a string of such simple-to-play games, with each supplanting the last as the coolest, most awesomest (you heard me) roll-and-write of them all! I was firmly on the Welcome To… train since the pre-order shipped. It was a taut, clever little game that gave multiple avenues to victory and, while still categorized as a roll-and-write, actually involved no dice whatsover. Considering it only recently made its way to pre-order customers and isn’t even in stores yet, I thought there was no way anything could dislodge it. I thought wrong. Railroad Ink (available in two versions, blue and red, each with different mini expansions) from CMON Games is a strong contender to knock Welcome To… off its throne. A marker-and-board version of a tile-laying game (think Carcassonne but you’re drawing everything), its breezy 7 rounds play even faster than Welcome To… without sacrificing any decision-making. Since the entire thing is visual, it’s extremely easy to teach to literally anyone. It’s still a challenge, and still deeply strategic, but its addicting in a way that I haven’t felt about a game in a long, long time. Mock me if you will, but in all my years of playing modern boards games I somehow never got around to this one; until today. We played three games with three different set-ups: First Game, Village Square, and Big Money. Of our group of 4, I was the only one who had never played Dominion before. I had played other deck-builders so I was familiar with the style and learning the game was quick. While I understood the basic mechanics of the game, I certainly didn’t grab hold of the strategy right away. I was jumping all over the place, buying any action card that seemed neat, and failing to buy any treasure cards. I was so poor in this game that I couldn’t even buy a Province, the card that provides you with 6 victory points. I ended the game with 9 points total: the 3 I started with and two 3-point Duchies that I bought during the game. The other 3 players were all around 25-30 points. By game 2, Village Square, I had figured it out. I won with a total of 37 points. My obnoxious strategy of playing Bureaucrats and remodeling Estates into Bureaucrats gave me the funds to buy those sweet sweet points. I didn’t win Big Money, but I also wasn’t in last place, so I think it’s safe to say I learned how to play. All in all, I liked Dominion and I would be happy to play it again. It’s quick, easy, and has good replayability, but you already knew that because literally everyone has played it. Now, so have I. Next postIs It Time to Abandon Battlestar Galactica (The Board Game)?